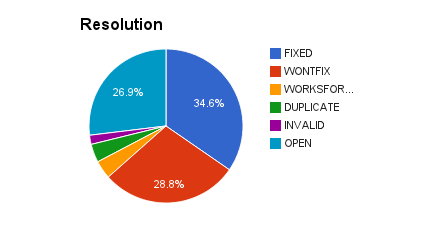 What are the performance regressions at Mozilla- who monitors them and what kind of regressions do we see? I want to answer this question with a few peeks at the data. 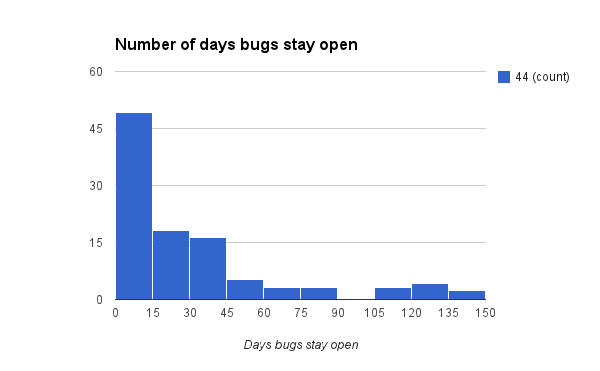 There are plenty of previous blog posts I have done outlining stats, trends, and the process. 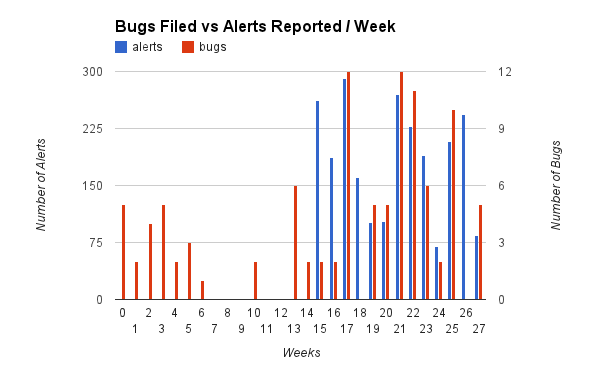 Lets recap what we do briefly, then look at the breakdown of alerts (not necessarily bugs). 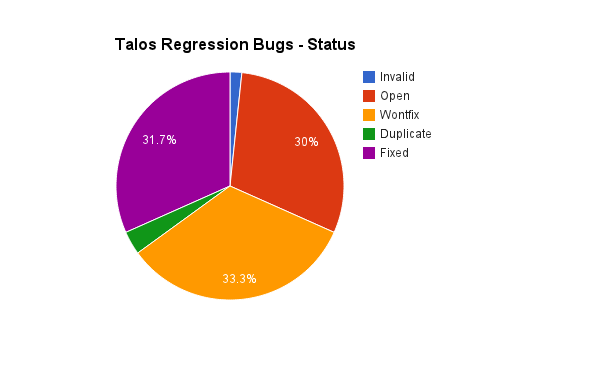 When Talos uploads numbers to graph server they get stored and eventually run through a calculation loop to find regressions and improvements. As of Jan 1, 2015, we upload these to mozilla.dev.tree-alerts as well as email to the offending patch author (if they can easily be identified). There are a couple folks (performance sheriffs) who look at the alerts and triage them. If necessary a bug is filed for further investigation. Reading this brief recap of what happens to our performance numbers probably doesn’t inspire folks, what is interesting is looking at the actual data we have. 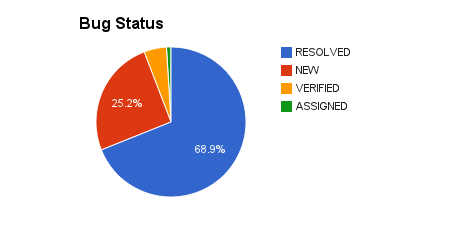 We have collected 8232 alerts! As you can see this is not a casual hobby, it is a real system helping out in fixing and understanding hundreds of performance issues. There are a few things to keep in mind here, mobile/mozilla-central/Firefox are the same branch, and for non-pgo branches that is only linux/windows/android, not osx. 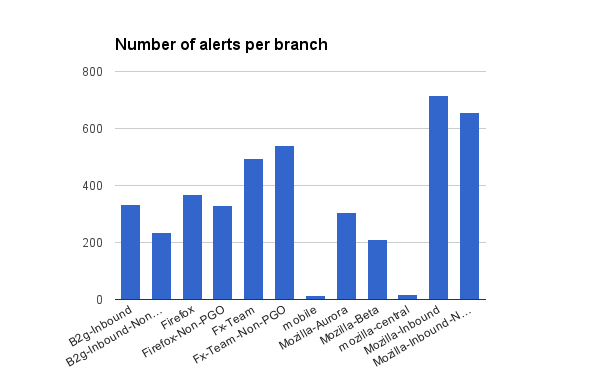 Looking at that graph is sort of non inspiring, most of the alerts will land on fx-team and mozilla-inbound, then show up on the other branches as we merge code. 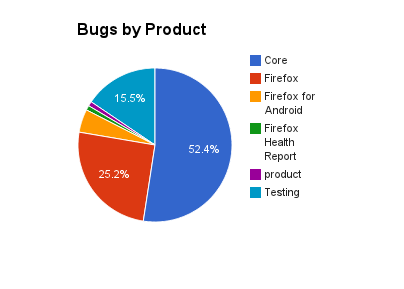 We run more tests/platforms and land/backout stuff more frequently on mozilla-inbound and fx-team, this is why we have a larger number of alerts. Given the fact we have so many alerts and have manually triaged them, what state the the alerts end up in? 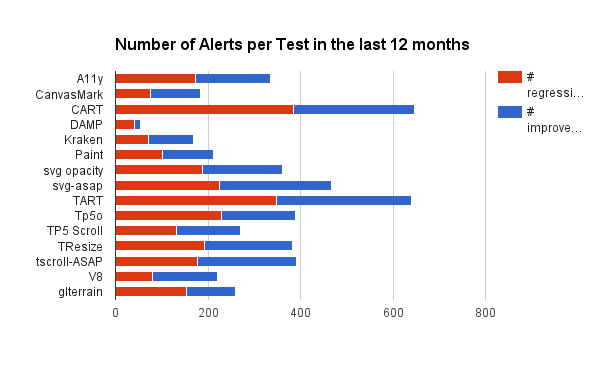 There are a few outliers, but we need to keep in mind that active work was being done in certain areas which would explain a lot of alerts for a given test. 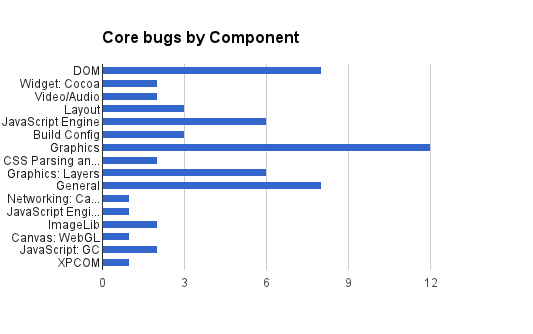 There are 35 different test types which wouldn’t look good in an image, so I have excluded retired tests, counters, startup tests, and android tests. Personally, I am looking forward to the next year as we transition some tools and do some hacking on the reporting, alert generation and overall process. Thanks for reading! A case of the weekends? What was famous 15 years ago as a case of the Mondays has manifested itself in Talos. 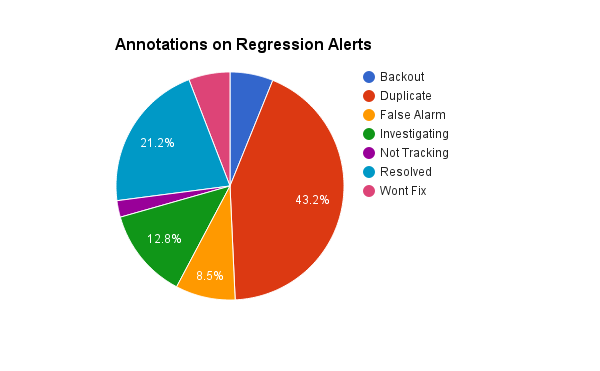 In fact, I wonder why I get so many regression alerts on Monday as compared to other days. It is more to a point of we have less noise in our Talos data on weekends. Many other tests exhibit this. What is different about weekends? Is there just less data points? 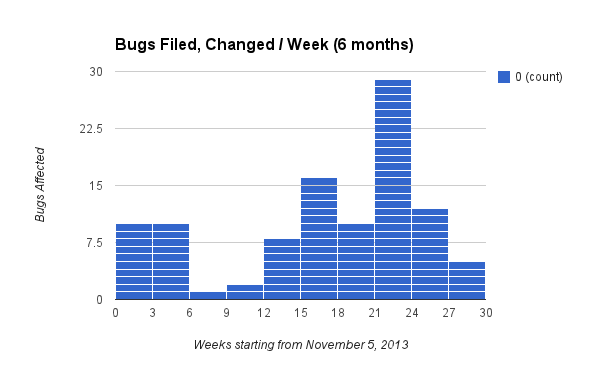 I do know our volume of tests go down on weekends mostly as a side effect of less patches being landed on our trees. If you have ideas on how to uncover this mystery, please speak up. I would be happy to have this gone and make any automated alerts more useful!